The Conscious Dying Institute (CDI) is a transformational learning organization that places healing practices in the hands of the people who matter most: Caring Professionals and Families. How? CDI offers the country's leading End Of Life Doula Certificate Onsite Training throughout the year in the United States and Canada. The End of Life Doula Certificate improves patient and family care by attending to the caregiver's inner awakening. The curriculum used in the EOL Doula Certificate is holistic and palliative in nature, increasing caregivers' capacity to give spiritual, emotional, physical, and practical care to anyone, regardless of diagnosis or care setting. It illuminates their authentic caring healing presence, restores their true purpose and power of healing agents, and is appropriate for clinical professionals, home and family caregivers, and staff in hospitals and senior health care systems. Our Mission: To Restore Death to its Sacred Place in the Beauty, Mystery and Celebration of Life, Create a new wisdom-based Culture of Care and Healing and Contribute to the Evolution of Human Consciousness. Graduates of End of Life Doula Certificate practice healing vs. curative care before, during and after death; across all health care settings. They work along side clinical professionals and families increasing precious quality moments of life, spiritual sanctity, beauty, inter-connectedness and appreciation of life for everyone. Through shared learning and practice, End of Life Doulas elevate the experience deathing. They learn to surrender and trust deeply in each moment. The rich, intensive, life-evoking Conscious Dying Education Doulas receive prepares them to be supportive end of life companions who offer the comforting healing care guided by what people want and need most. End of LIfe Doula Support for Caregivers, Patients & Families Best Three Months of Life Coaching and Care Planning Personal DreamworkFor Private Consultations with Tarron or Information about CDI, fill out the form below. We look forward to hearing from you! For Private Consultations with Tarron or Information about CDI, fill out the form below. We look forward to hearing from you! Conscious Dying Education prepares Graduates to facilitate Conscious Dying Education and Care. It prepares those who wish to bring this important work into their communities and transmit their heart wisdom to others. A fundamental assumption of Conscious Dying Education is that the nature of our heart is to give back the love, care and wisdom we receive. 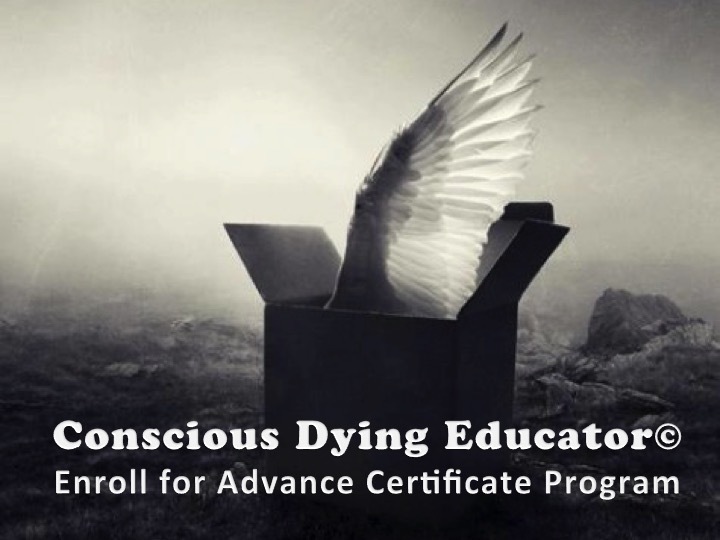 Having received profound personal healing care from the End of Life Doula Certificate course, the future teacher discovers and gravitates toward giving back their own unique gift, teaching style, and offering as a leader and facilitator of Conscious Dying Principles and Practices. The future Conscious Dying Educator enters the training with a passionate soul's calling to increase the number of people receiving the comforting, healing care they most want and need at end of life, whether in their home, hospitals, nursing homes, or senior communities.